Here is the essence of Fall baking. Time to dispense with the fancy and get down to the basics. 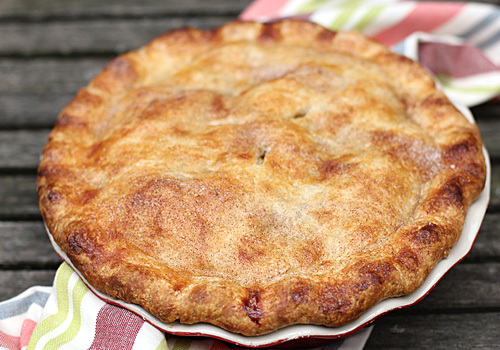 Apple pie is the fundamental American treat. Its virtues have been documented in song and verse through every epoch of our history. And with good reason. This is sweetness that brings the family together, can evoke debilitating spells of nostalgia, and sells Chevrolets at the same time. Enough with the pomp, let's get down to business! I had a standard pie that I thoroughly enjoyed (and method that I still partially use), but several years back Cook's Illustrated came out with their rendition of a deep dish apple pie. It was strikingly similar to the recipe that I used at the time, but it had twice the amount of apples. In my book, more apples means more goodness. So, I decided to blend the two recipes for the perfect apple pie (at least for my taste buds). 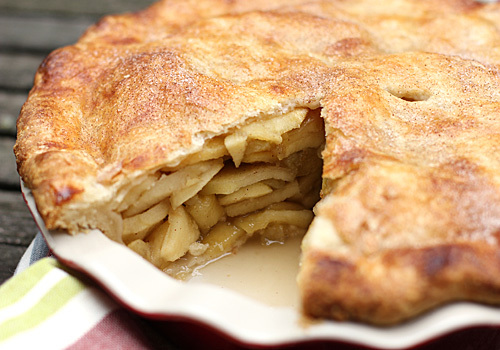 as you can see, LOADED with tender sweet apples and a flaky, buttery crust. À la mode with a scoop of good vanilla ice cream is certainly optional, but I highly recommend it to enjoy the traditional American experience. Comfort food. What could possibly make it any better? Versatility, that's what. We'll get to that after I sketch the outline. The original recipe called for only 1/4 cup of onion-- what?! We like onion so I throw in a whole medium yellow onion. 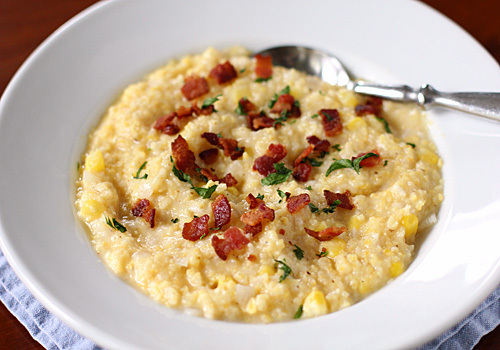 I use a touch more garlic and reserve the bacon as a garnish for texture-- creamy polenta and crunchy bacon means yum! Some crushed red pepper flakes never hurts either. Back to that beautiful "V" word, I serve it as a side to roast meats, meatballs, and roasted vegetables. I send it for lunches packed in thermoses and we even enjoy it all by itself. However, there is another way, and it is my favorite way. First, crack open the windows to let the cool Fall air stream in. Then, put on your favorite bulky sweater (hoodie- optional). Ladle a good scoop of the creamy, cheesy polenta into a shallow bowl. Fry up an an egg, gently place it on top, and garnish with the salty, smoky bacon bits and fresh parsley. Set your hard working body down into your favorite comfy chair and dig in-- mmm! Now the only thing keeping you from getting out of that chair (and right back in) is dessert. As much as we love our standard bowl full of mush, it is nice to have a change. And when that change borders on dessert, it's most certainly a welcome one! This baked oatmeal, unlike a true dessert, does not have copious amounts of butter and sugar, but the flavor begs to differ. 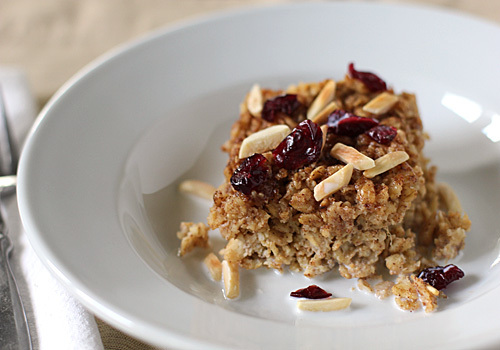 The oats are moistened with applesauce and plain yogurt for a healthy note. I use my homemade applesauce and I strongly urge you to do the same:) The oatmeal is spiced with a bit of cinnamon and served warm with toasted nuts, dried fruits and a good pouring of warm milk. With the cool temperatures outside, this is a lovely thing to wake up to. Not to mention if you make it the day before, you can give yourself a few more minutes under the covers before it needs to be reheated. If you are a regular reader, you probably know how important our Sunday dinners are. We are fortunate to be able to eat almost all our week day dinners together, but it is the Sunday dinner that we look forward to the most. It is a time when we can talk and share about the week before and the week ahead. We have discussions about life, history, politics, and other topics. It is a time where we can linger without having to rush out the door to soccer practice, a basketball game, or a school meeting. It is a family time-- a time for us to be together. This Sunday is the fifty-second Sunday dinner that I have shared with you. That's right, a whole year of Sunday dinners and we didn't miss a one. Whether we were in a cabin in the woods, a house on a lake, or in our very own home, we sat down to eat, share, and love. In the future, most of our Sunday dinners will be repeats. But there will be times where I switch things up and try-out a new recipe. That means it will be difficult for me to share a recipe from our Sunday dinner. This past year I was able to share a recipe each week for several reasons. First, I knew it tasted good. Second, it was already made the night before or that morning. Third, I had a picture of it from a previous dinner or after taking one that day. So, I will continue to share our menus with links to recipes I have previously shared, but I can't always promise a recipe. What I can promise is that I will share all the recipes over the course of time. This Sunday is an example of me having a picture of the dish from a previous Sunday dinner. I already knew it tasted good, I just didn't have a picture to share that Sunday because I didn't have it made. This is a tasty side dish to serve with just about anything. 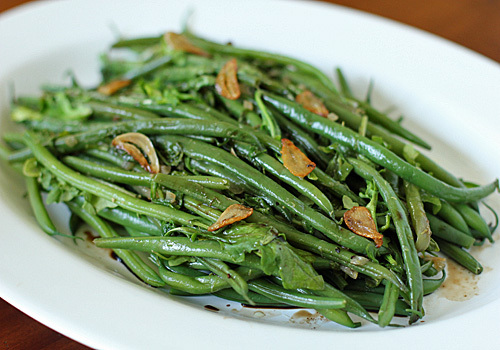 I like to use the slender haricots verts instead of the plump green beans. They are par-boiled just until tender and then sautéed with slivers of garlic. Then they are tossed with peppery arugula and flavored with a bit of lemon zest and a good balsamic vinegar. This is a dish that I have served with pork, fish, and chicken to rave reviews. It's Fall! Whoohoo!! Fall is without a doubt my favorite season. I love the change of colors, long walks in the woods with my family and our doofus Black Labrador, picking apples... I love watching college football, sleeping with the window open on a cool night and waking up with a cold nose, and I love Fall baking and cooking. So, I thought it would be fitting to start the season off with this recipe. Enjoyed as a morning treat, prelude to a long walk, afternoon pick me up or a late night indulgence, these doughnuts are sure to satisfy. I am embarrassed to say how long I have been holding on to this recipe. I made it once and it was o.k., so I held on to it hoping to make the changes to suit my tastes (that was five years ago). Fast forward to a couple of weeks ago when I was out shopping and purchased a new cookbook all about doughnuts. 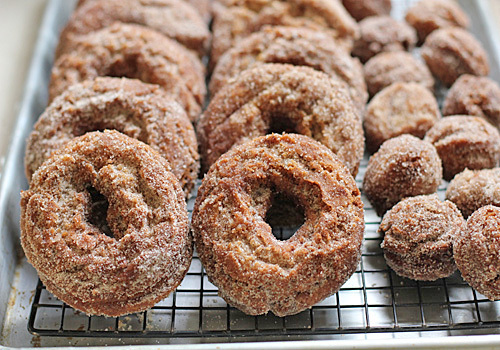 Of course, the first page I opened to was-- Apple Cider Doughnuts. Although quite different from the recipe that I had that was collecting cobwebs, it did have a few new ingredients that I thought might help the old ones. And you know what? They did. Especially the small addition of graham flour. It makes for a wonderfully nutty crunchy crust. With a few extra additions of my own (a double concentration of cider and some extra spices), these came out great! 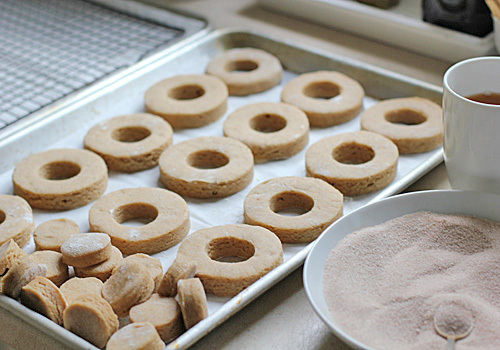 Here are a few step by step photos to help you with the doughnut making process. Once the dough is mixed, line two baking sheets with parchment paper. Generously dust one of the baking sheets with flour and add the dough. Dust the top of the dough with flour. 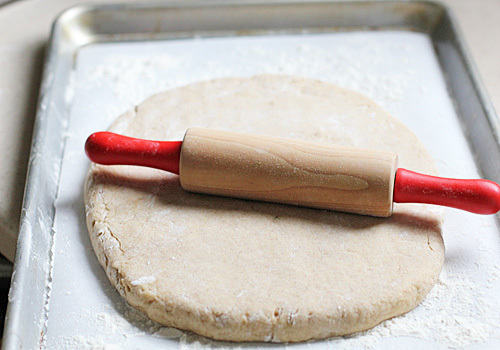 Using the rolling pin from your child's baking set (love those little kitchen tools:), or just pat by hand, roll the dough to a 1/2-inch thick. Place the baking sheet in the freezer for 20-30 minutes to firm up. 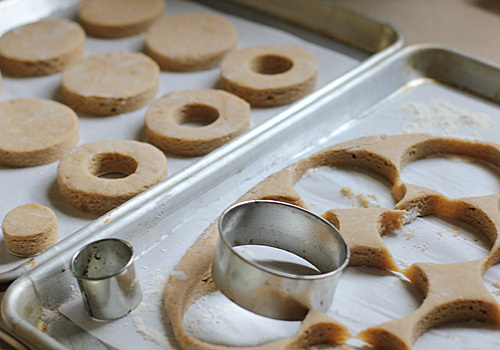 Once chilled and frim, use round cutters to cut out doughnuts and doughnut holes. 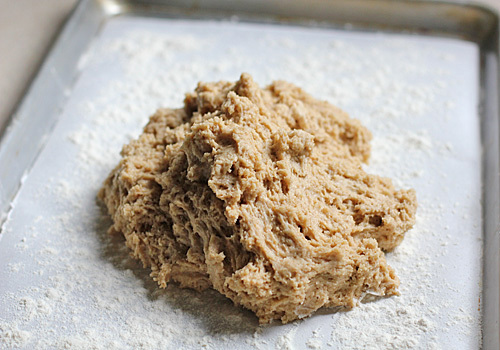 Place the cut dough onto the other prepared baking sheet. Scraps can be rerolled and cut again (chilling if necessary). Place the doughnuts in the refrigerator to rest for 30 minutes. 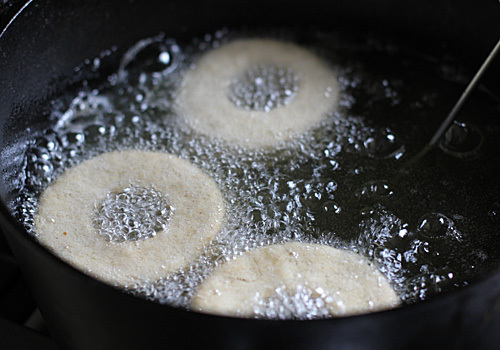 When the oil reaches 350º F. Gently drop the doughnuts into the oil a couple at a time. Too many will cause the oil temperature to drop too quickly. 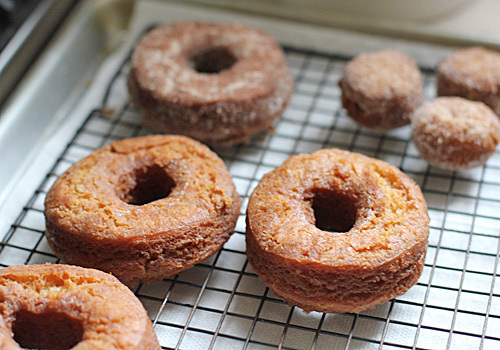 Remember, these are cake doughnuts and they are delicate. No pushing or prodding, otherwise you will have doughnut misfits. Tasty, but not pretty. Fry on both sides until golden brown. Drain the doughnuts on a wire rack set over a paper towel lined baking sheet. Allow to cool a few minutes before dredging in the cinnamon-sugar mixture. Enjoy them warm, at room temperature, or for any leftovers, warm briefly in the microwave for a melt in your mouth treat that will really get you in the seasonal mood. Embrace Fall and the change of the seasons. Aside from roast chicken, I don't repeat many main dishes for Sunday dinner. There are so many seasonal recipes to make and it's hard to resist trying out new ones, too. I won't be making this dish for quite some time, so I thought I would share the recipe. 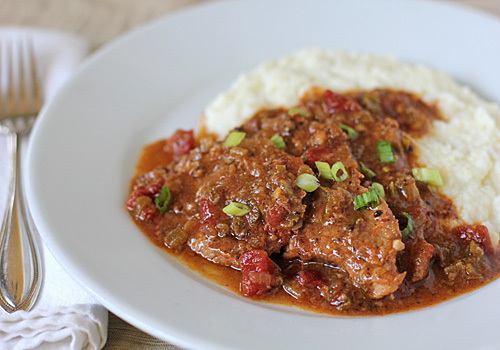 Grillades and Grits is good creole comfort food. It is beef or veal (I prefer the veal) that is pounded very thin, browned on both sides, and simmered in a broth/wine/vegetable mixture. The meat becomes fork tender while the gravy deepens in color and flavor. It is then served over a generous helping of stone ground grits. 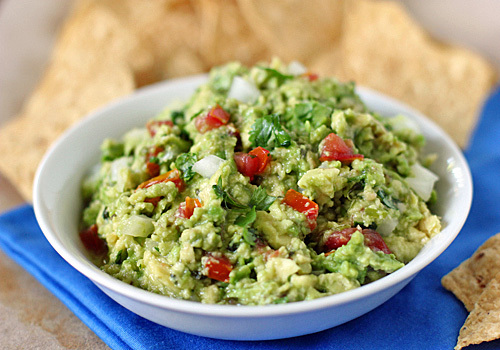 Garnish with a few chopped green onions for more color and flavor, then give it a few dashes of Tabasco for a kick. Take a fork (no knife needed, but you should use one to be polite at the dinner table:) and dive on in! Oh, and if you have the time, make the grillades and gravy (not the grits) the day before. As good as it is the day you make it, it really has that "next day better goodness", making it a perfect dish for entertaining. Right now I find myself in a scramble of sorts. I am trying to savor and store the last of the summer bounty, yet I am gearing up for the cool weather baking and holiday eats! This is one of those recipes that falls in between. As delicious as it is now with fresh sweet summer corn, it is also quite tasty during the colder months using frozen corn (stock the freezer now). 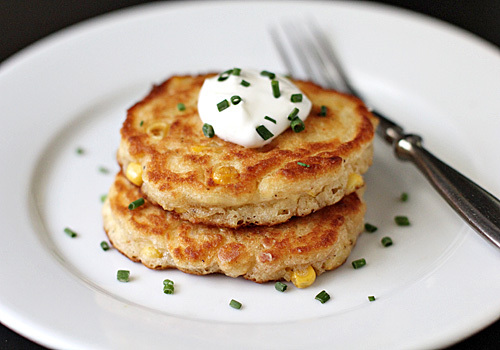 There are many variations of corn pancakes out there, but I enjoy the ones that are simply pancakes with corn. No cornmeal or other fillers, just batter and corn. This recipe separates the whites from the yolks, giving you a light batter. I use buttermilk for a bit of tang, as well as a bit of sugar and cayenne pepper for a sweet and teeny bit of spice. They are cooked in a skillet until golden brown and crispy, then topped with sour cream and chives. They are perfect as a light dinner with a small salad or roasted vegetable on the side, but they are also quite tasty when served on the side with roast pork or baked ham. Oh, and if you have any leftovers after serving these with the ham or pork, they make for a tasty alternative to the usual sandwich bread for school lunches. Ham and corn pancake sandwich? My children give it a thumbs up! This Sunday Dinner is my prelude to Fall. Actually, it is the last Sunday Dinner before Fall official hits the calendars and weather maps. I try to be a seasonal and weather related cook, so I wanted a meal that reflected the not-gone-just-yet warmth of the sun, the cool breeze in the air, and all the good smells of the current changing season. This menu fit the bill and the appetizer is the recipe I am sharing today. 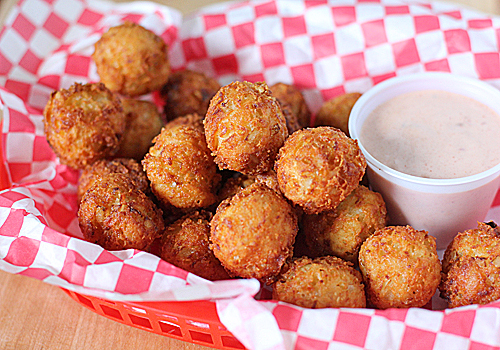 Shrimp Beignets-- a.k.a fried balls of sweet shrimp goodness! This recipe came to me from my mother. She originally made them with cooked, chopped crawfish, but I prefer the sweetness and tenderness of uncooked, chopped shrimp. Don't worry, the shrimp cook completely through once fried. I also added a little garlic to give the flavor a boost. 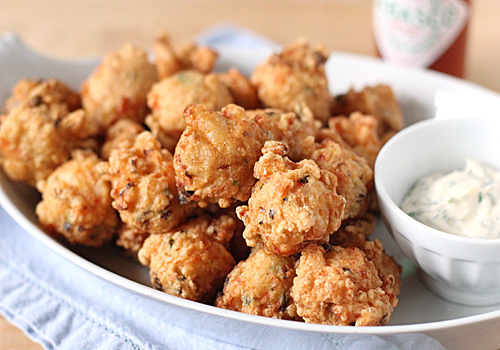 Dipped in a little tartar-like sauce and extra hot sauce on the side (that's a must), these tasty little shrimp fritters are the perfect beginning to our Sunday dinner. The original recipe made half the recipe below, so feel free to halve it. However, I always have a hungry crowd. There are a few leftovers, but my children are more than happy to have them packed in their lunch box for the next day. With three children, it is safe to say that I have spent my fair share of time waiting, and waiting, and waiting in the doctor's office. Fortunately, there have been a few times that I have been rewarded for the long waits. These rewards have come mostly from flipping through magazines for ideas and recipes. This recipe is one of those rewards. It came to me when I was pregnant with my third child over seven years ago and we have enjoyed it many times since. If you are a reader, you will remember that my now teenage son celebrated his birthday this past Sunday. This was the cake he chose (good choice!) and I couldn't let the week go by without sharing the recipe. It is a chocolate cake flavored with espresso powder and baked in a baking sheet instead of the usual cake pan. Once cooled, the sheet cake is cut into thirds and then layered with a delicious buttercream that is again flavored with espresso and a wee bit of Kahlùa because I like it. 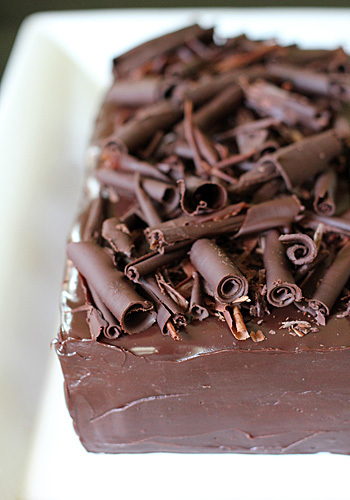 Once chilled, a luscious semisweet ganache is poured all over. You could stop there and enjoy it as is, but when I roll out this recipe for a special occasion like a birthday, I like to make it all purrty with chocolate curls and shavings. 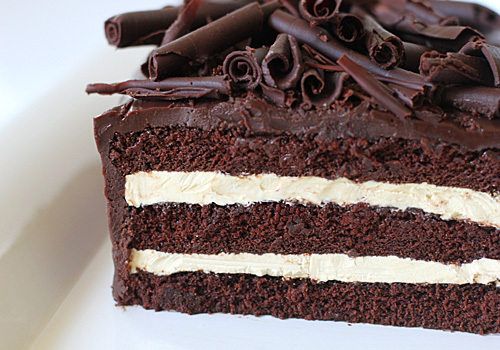 With layers of cake, cream, and chocolate, this cake is a trio of different layers and flavors that will have your fork telling tales in the dishwasher. Several months ago, I had never eaten a flauta. Come to think of it, I had never even heard of them. Taquito-- yes. Flauta-- no. But, after reading a restaurant review and seeing a picture of a bowl of them "drowned" in a tomatillo broth, I had to have them ASAP. So, into the kitchen I went. I started with the flauta which means flute in Spanish. I knew that with a fried and crispy outside, I wanted a contrast of texture on the inside. I choose shredded chicken, refried beans, and Chihuahua cheese-- a combination my whole family enjoys. With the addition of sautéed onion and a little spice, it made for a flavorful and creamy bite. For the broth, I used my roasted tomatillo salsa as a base and added jalapeños and chicken stock to make a broth with a little kick. My husband claims he could drink shot glasses of the green magic liquid. 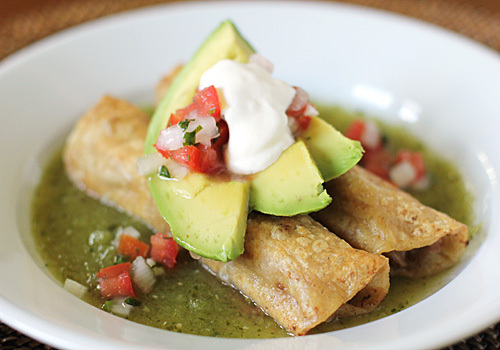 The lovely part of this recipe is that both the flautas and the broth can be made in advance and stored in the refrigerator or freezer; perfect for a busy weeknight. You can also make this according to your own preferences. You can use other meats or go vegetarian. Remove or add more spices and heat from the peppers to taste. All together now, "Make it for you, make it your own:)" When ready to serve, fry the flautas in a skillet with a little oil until crisp and golden. Place the edible flutes in a shallow pool of the warmed broth, top with some avocado slices, pico de gallo, and sour cream-- WOW! It's the flavor-- Es el sabor-- that will have you coming back for more. Easing into Fall baking, I am starting with the soul-warming spice of cinnamon. This tasty treat with the smell of far off burning oak leaves coming through the window on a cool breeze...yep, the change of seasons mounts a sensual assault. I am trying to think of the best way to describe this loaf. 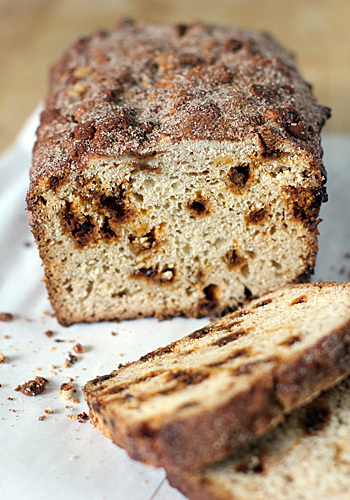 It's a cross between a quick bread and a yeast bread with a nod to coffeecake. 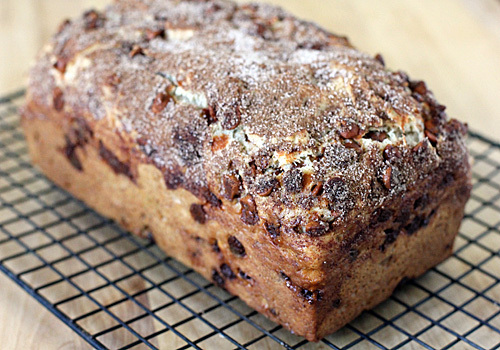 Let's just say if coffeecake and cinnamon toast were to have a love child, this loaf would be the end result. 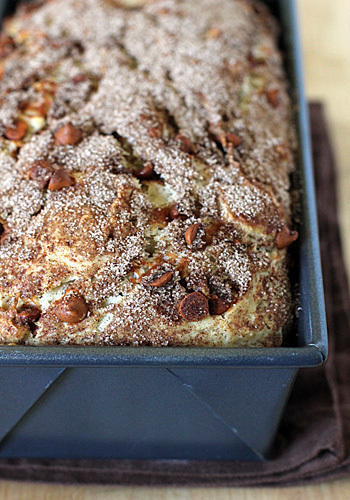 If you are apprehensive about baking with yeast, have no worries here. With the addition of baking powder, this loaf rises beautifully without fail. The only trick is to make sure that the loaf is completely baked through. Like a quick bread or cake, test the center with a toothpick. It should come out clean. Also, resist the urge to slice into it immediately. Doing so will leave you with a gummy loaf. It is delicious served plain, but I highly suggest toasting a slice and giving it a good slathering of butter. Ooh, man that's good! *Bonus Alert*--- It will make your house smell fantastic! 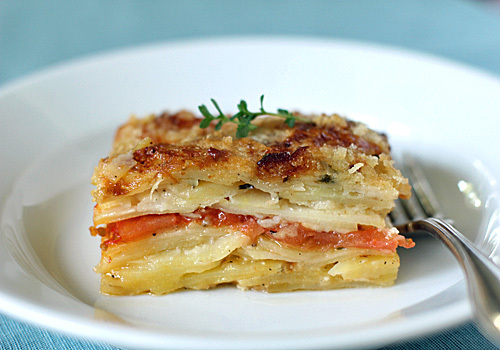 Paper thin slices of potato layered with butter, cheese, herbs, and tomatoes is a delicious side to our Sunday dinner. I have many variations of this recipe, but this is the one we enjoy during this time of year to take advantage of those ripe and sweet summer tomatoes. I also use a little chicken broth in lieu of more half-and-half or heavy cream to lighten it up a bit. 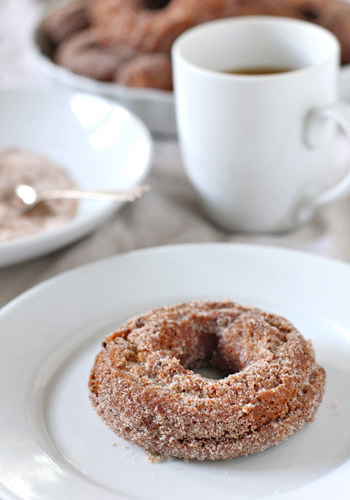 It is tender and flavorful with a crunchy crumb topping. The gratin slices beautifully and reheats very well. I do hope you give it a try! Ten years ago today, I stood with my arms around my son. I watched balloons tap at the ceiling while the voices of shocked news anchors narrating the terrible scenes from New York and Washington, D.C. filled the room. I looked at him, then the screen, back and forth in a fog of disbelief. My son turned three that day. Now he is a teenager. He will be joining thousands at the Chicago Bears game today. A moment of silence. Perhaps a flyover. The American way of life carries on. This is his birthday menu after the game. God bless all of the survivors of those killed on September 11, 2001. Mexican food is as varied as it is glorious. I have so many recipes that I want to share, but I need to get to some of the basics/condiments before doing so. And since tomatoes are still peaking, I wanted to highlight this recipe. 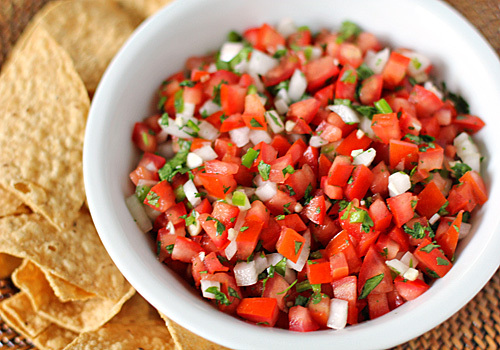 In my estimation, a good pico de gallo can go with just about any dish in the category. Serve it with tortilla chips, tacos, flautas, or anything south of the border that strikes your fancy. Better yet, stay tuned until tomorrow and I'll share with you another simple, but favorite mexican condiment/dip using this recipe. 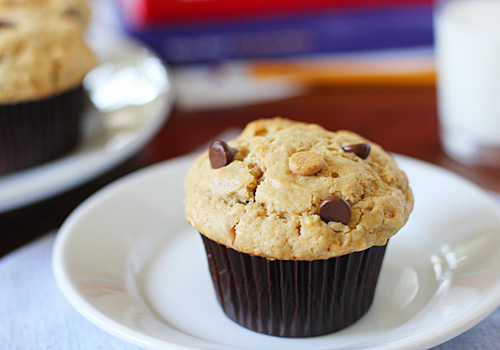 School is in full swing, so it is time to get back in the lunch box treat and after-school snack groove. These muffins are seated front and center. They are a moist and satisfying balance of peanut butter and chocolate without being too sweet for a snack or treat. Peanut butter is protein and chocolate has antioxidant properties. So they are good for you, right?! Like most recipes, this one is flexible. My son likes chunky peanut butter and my girls like the smooth stuff, so I use a mixture of both to appease all. I like a mixture of milk and peanut butter chips, but you can use all chocolate if you prefer. I have even seen chocolate-peanut butter swirl chips at the market and I think those would be a tasty addition. Mostly I make them standard size for after school snacks, but they are a welcome addition to lunch boxes in mini size. Any way or size you make them, a plate full of these with a tall glass of milk will be a much appreciated bit of sustenance when saddled with a stack of homework. *One note-- when filling the muffin tins, be generous. Normally one would fill a muffin tin about 2/3 full, but these muffins need to be filled all the way to the top for a perfect bakery-style dome. We had our first sniff of Fall yesterday; sunny skies, dark passing clouds, a steady, cool breeze, and temperatures hovering in the mid 60s. I can almost smell all the wonderful baked goods and comforting Fall foods. However, I am not quite ready to give up on the stars of late summer produce, like corn and tomatoes. Fortunately, I can have both Fall and Summer with this recipe--a bowl of sweet corn to satisfy my summer craving and a warm bowl of chowder to take off the early Fall chill. 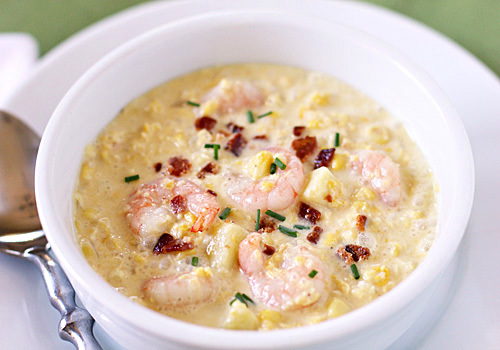 Corn, shrimp, potatoes and bacon all come together in this bowl of goodness. Half the corn kernels are puréed and the other half are left whole giving you a perfect texture. The potatoes add body, the shrimp add meatiness, and the bacon takes it over the top. A dash of cayenne adds a welcome bit of heat. This is also a flexible recipe. If you don't want to use shrimp, simply omit them from the recipe and add more potato. Got lobster instead of shrimp? That's great, too. The original recipe made a corn broth using the corn cobs, but I use chicken broth both for simplicity and because I always have some in the refrigerator (and I like it). You can use water or vegetable stock instead. Like I have said before, make it for you, make it your own. After a fun and winning day at the football game yesterday, I needed a complete departure from all those good, but totally unnecessary game day eats and drinks. I had a few ingredients in my refrigerator and pantry that needed to find a home, so this is how today's menu came to be. I tore out this recipe from the Bon Appétit: Restaurant Issue, September 2007. It was created by Marisa Echhuarren and Francois Paniego, a mother-son cooking duo from Spain. Tejas means "roof tiles" in Spanish. 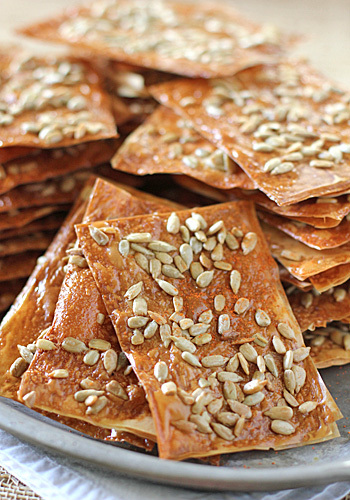 These are delicate crackers made from a few layers of phyllo dough. 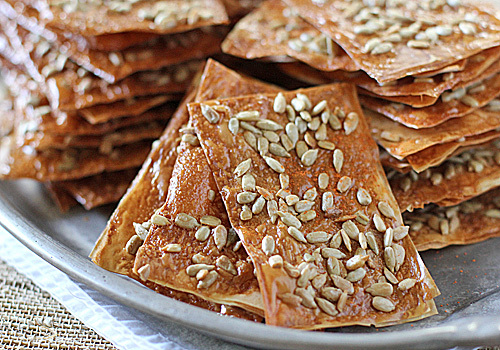 Each layer is brushed with a sugar, butter, and egg white mixture; cut into rectangles and then sprinkled with sunflower seeds before they are baked until golden and crisp. The original recipe only used two layers, but I use three for a slightly sturdier, yet still delicate cracker. I also use roasted and salted sunflower seeds because I like the sweet and salty combo. A little cayenne pepper for a nice kick and these are a perfect sweet and savory beginning to our Spanish inspired meal. I made these a few years ago for a party and they were really good, but I knew with a few adjustments, I could take them to the "ultimate" cheese ball level. Verdict-- these are incredible and worth every bit of their unhealthy nature. My only conundrum after dipping in the mayonnaise sauce is-- do I take a bite with a dash of cayenne or Tabasco? Good thing I don't have to decide. I can have the first one with cayenne and the second with Tabasco and the third one with cayenne and the fourth one with Tabasco and-- o.k, I'll stop and share. Oh, and if you are a lover of all things college football and tailgating, head on over to this site, Taylor Tailgates. From mascots to vehicles to fans, and of course, food, Taylor covers it all with superb photography and writing. I couldn't share the grilled salmon recipe without sharing a side worth writing about. This recipe comes from the current (August) issue of Bon Appétit. I first made this several Sundays ago for a large family gathering and have made it twice since. It's that good! The original recipe called for roasting the corn unhusked in the oven, but the corn has been so sweet that I just sauté it in the pan. The original recipe also called for finely grated Manchego, but I chose to use an aged Manchego that I put in the food processor to achieve small crumbles. 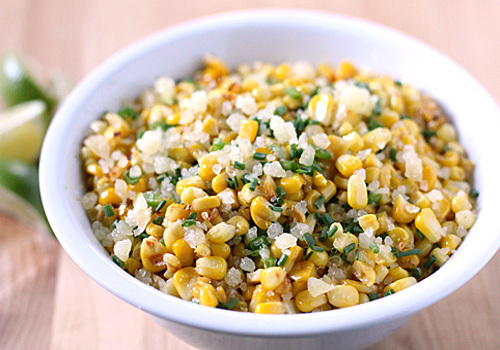 A little bite of corn with a crumble of nutty, buttery cheese-- yum! I also added some garlic along with the jalapeño, crushed red pepper, chives, lime zest and freshly squeezed lime juice. The first time I made this my family asked if I was going to put this on the blog. To those of you who asked for the recipe, here it is! *Note-- if you can't find an aged Manchego, a good aged Parmiggiano-Reggiano could be substituted.